I have come to find that when travelers want to journey to Peru, they want to see Machu Picchu; and rightly so! In 1983, UNESCO designated Machu Picchu as a world heritage site. 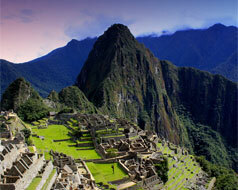 Since then, millions of travelers “re-discovered” Machu Picchu and its majestic beauty. While it is one of the highlights of coming to this great country, Peru is much more than Machu Picchu, the Lost Citadel of the Incas. The Colca Canyon: Immerse yourself at the home of the Colca River where you will find yourself amongst vibrant Inca ancestral roots. The Amazon River: Catch a glimpse of the Amazonian wildlife and meet the locals living in nearby villages as you sail on the Amazon. Rainforest near Puerto Maldonado: If you didn’t get enough of the wildlife on the Amazon River, head over to this pristine rainforest. Chiclayo and The Lord of Sipán: Ever heard of King Tut? Well, Chiclayo is the proclaimed the King Tut of South America. His place of burial is called The Lord of Sipán where multiple mummies were originally found in 1987. Tucume and the ancient mud pyramids: You don’t need to go all the way to Egypt to see pyramids! These pyramids are unique, however, in that they are constructed out of mud. Peru is truly a land of adventure. Unfortunately the average traveler knows only one or two places and not much more. Don’t let this be you. Embrace all of Peru and get the full experience, for Machu Picchu is just a small taste of Peruvian history and culture. MACHU PICCHU UPDATE: About 2,500 visitors enter Machu Picchu on a daily basis. In order to protect this archaeological treasure for future generations, the Peruvian government has announced new rules to visit Machu Picchu. Now the citadel can be visited on a split entrance time: Morning entrance from 6:00am to 12:00 noon, and afternoon entrance from 12:00 noon to 5:30pm. Previous to this change, anybody could visit the ruins without a guide. Now, a qualified local guide has to accompany you. As of July 1, 2017, the government has established three circuits to visit the ruins. Each circuit takes between 2.5-3 hours. You can visit one circuit in the morning and afterwards, if you decide to visit a second circuit, you can buy a new ticket to another circuit in the afternoon. If you want to visit the last circuit, you have to stay one night in the village at the foot of the citadel. Not all of the circuits are equal as each has a different level of difficulty. For any additional information you can call our expert at Columbus Travel, Carlos Fida at 1-800-373-3328 or 801-295-9568.